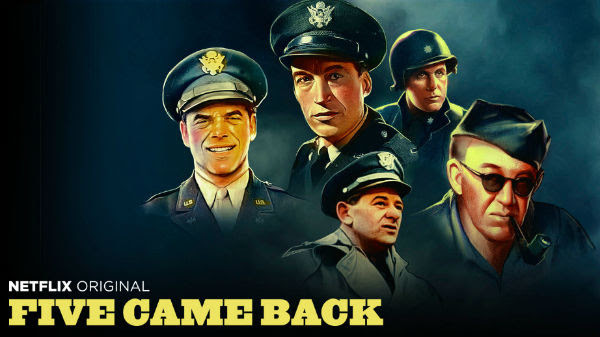 Five Came Back is a documentary based on the book of the same name by Mark Harris. The documentary goes into these five directors service during World War II and the how it shaped not only their lives but the lives of the people who watched their movies. The three-part documentary was added to Netflix on March 31st, 2017. I'm big into documentaries, especially war documentaries, so when Five Came Back showed up on Netflix there was no question that I'd give it a go and I was not disappointed. The five directors that this documentary is about are John Ford, William Wyler, John Huston, Frank Capra and George Stevens. After Pearl Harbor, these five directors wanted to help out their country but were too old to just enlist and because of their work as film directors were able to get Washington to allow them to join up to make newsreels that could be played before the main attraction in theaters. Each director had different goals that took each of them to different parts of the world. With all five directors dead their story is told with archival footage and with people that worked with them that still live. To bring their visions to life they had to face many struggles besides the regular danger of war. The biggest one to stick out was one of the Jewish directors who was told that if the plane he was riding in went down over Europe and was captured alive the Nazis would treat him the same as any other Jewish person they got their hands on. The documentary goes on to show how their experiences in World War II helped to shape the movies they would make. I checked the AFI 100 Greatest American Movies list and these directors combine to have nine post-war movies on the list with George Stevens having the most at three. It just goes to show you the roll their war service played in the films they made after going back to movies. I also liked hearing from modern directors whose movies were influenced by these five directors as well including Steven Spielberg, Francis Ford Cappola, Lawrence Kasden and Guillermo del Toro. The best part of this documentary is that Netflix also released 13 of the documentaries that are talked about. Since these documentaries were produced by the United States military during World War II they are in the public domain already but having them right next to this documentary makes it easy to go from one to the other. I enjoyed this documentary very much and am currently working my way through the 13 other documentaries. Fans of World War II and film history will probably enjoy this one so if you have Netflix I suggest you check it out.